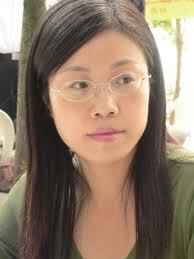 Ye Mi was born in 1964 in Suzhou, Jiangsu, where she still lives . She was six years old when her parents were "sent to the countryside" during the Cultural Revolution, specifically to Yancheng City (盐城, the "city of salt"). She remained there until the age of fourteen. In a rare interview, she alludes to harsh living conditions but it was also a formative period that allowed her to directly experience the povertyof the common people among whom she then lived, and their great resilience in the face of misfortune. She developed a particular sensitivity to their lives and this is what constitutes the essence of her literary inspiration. Her work has a great consistency, despite the diversity of the situations depicted, and she has a very personal style. A longer biog and a short story, Velvet (《天鹅绒》) can be read on Chinese Short Stories.com together with a translation into French by Brigitte Duzan. In 2012, Ye Mi had a new book published, 《恨琵琶》 Pipa Regrets in which she brings her countryside characters to town, describing their lives and experiences in characteristically grim and dispassionate tones.